The design and installation of ventilation systems for controlling indoor air quality are fundamental to healthy working environments in large buildings. DSL has many years’ experience in the design and installation of air handling units (AHU) situated on rooftops and in basements. 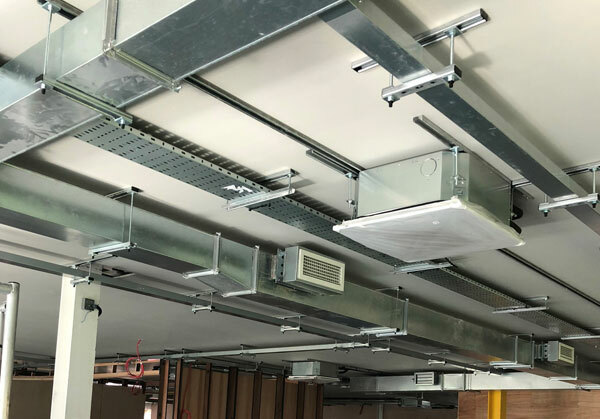 Utilising computer aided technology, the complete system from the AHU, ducting, and through to the termination grills, can be planned in conjunction with the architects vision for the use of the building. From design and planning to construction and installation DSL has collaborated on many new build and renovation projects where understanding the aesthetics of the building influences the final layout of the ventilation system. DSL has a broad portfolio of supplier/partners so are able to offer a wide selection of ventilation solutions.